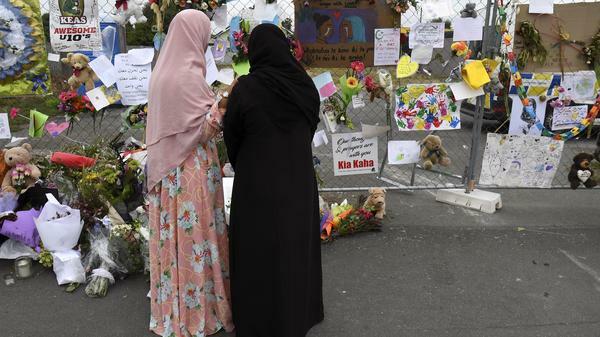 Women look at tributes left at the Linwood Islamic Centre in Christchurch, New Zealand, following the March 15 massacre at two mosques. On March 15, a 28-year-old Australian man opened fire in two mosques in Christchurch, New Zealand, killing 50 people and injuring dozens more. The shooter had previously declared allegiance to "white identity" — a fact that came as no surprise to J.M. Berger, an author who studies extremist movements. "We're seeing a resurgence in various countries," he says of white nationalism. "It's a worldwide phenomenon." Berger, who studies the online activity of extremists, notes that the New Zealand shooter praised President Trump as "as a symbol of renewed white identity" in a 74-page document he published before the massacre. That mention, Berger says, aligns with a trend he found when he studied the hashtags and language used by alt-right Twitter users. "When we do the social media analysis, it comes shouting out at you," he says. "We can count the links that they put out on Twitter and other social media platforms, and what we find is the most common is '#MAGA.' The most common description of somebody that they use in the profile, they use on Twitter, is 'Trump supporter.'" Berger is the author of the book Extremism and co-author of Isis: The State of Terror. Mitt Romney, John McCain [previous Republican candidates for president] — white nationalists hated these guys. ... They were really too clearly against them to be of use for the movement, and what they find with Trump is that he's somebody who's much closer to their world views, and he declines, on repeated occasions, to directly attack them. So what we've seen is because Trump is a huge magnet for news attention, for media attention, he's a really useful figure to give all these diverse movements something to coalesce around. White nationalism and the far-right in general is very factional. Everybody has their own little group. The groups don't get along. They don't believe the same things. There's often a lot of infighting and they sometimes kill each other. What they have now is kind of a common theme, a common cause that they can work into their dialogue, and make it more palatable to people. It helps bring out the attitudes that are friendly to what they want, and really, support for him has become a crystallizing factor. One of the few things we really know about this guy is that he was very steeped in trolling culture. So the original manifesto and the link to his video were first posted on 8chan, which is a trolling site. There's all manner of anti-social content on a site like that, including a lot of white nationalism and a lot of other extremely objectionable kind of views. But a lot of what they do is cloaked in this sort of shroud of irony. So they're being "funny" and it's designed to provoke people, to offend people, to get them chasing down rabbit holes of content, and to put misinformation out that has to be corrected later and kind of muddies the truth around things. ... So there's a real culture here of messing with the media; messing with the mainstream narrative. ... A lot of what's in this manifesto is really designed to mislead. It's not like some of the previous examples we've seen, which are very sincere and ideological. There's a lot of jokes in it, and it's kind of horrifying to think that somebody would kill 50 people to get a series of bad Internet jokes out in circulation in the world. That's certainly not the only reason he did it. He certainly appears to sincerely have these kind of anti-immigration and white nationalist views, but this is sort of a new thing, and it caught a lot of media unawares. So there were a lot of reports that just unironically repeated things that were in the manifesto, that were clearly questionable, clearly meant ironically. Some of them are memes or were sort of deep cut jokes that were really pulled out of obscurity, and some of them are almost certainly incorrect. If there's a mythological element that unites a long, wide variety of extremist groups, it's the threat that guns are going to be taken away. This is just a unifying fear and attitude in these groups. It's been used extensively to try and promote these movements. What we've seen even more in the last couple of years is a wave of other books that seek to maintain the extreme gun control theme without having quite so much of the overt racism. So we've seen a lot of extremist authors. There's this incredible body of dystopian, extremist fiction that I'm currently working on for a future project, and what you see is that people from a lot of anti-government viewpoints, people with different kinds of racial viewpoints, they're all writing books that open up with guns being taken away. I don't think extremists should be able to dictate our policies and public discourse on this, but I think we should also be aware of what effect something like that here would have on them. Amy Salit and Mooj Zadie produced and edited the audio of this interview. Bridget Bentz, Molly Seavy-Nesper and Meghan Sullivan adapted it for the Web. This is FRESH AIR. I'm Terry Gross. Extremists, their twisted ideologies, the misinformation they feed on and how they use social media to amplify their message and recruit new followers and the violent acts they incite and commit. This is what my guest J.M. Berger studies. He's written about ISIS and other jihadi groups. And he's followed white nationalist movements in the U.S. and abroad and how they feed on fear of Muslim immigrants. It's been less than two weeks since a man from Australia massacred Muslims in two mosques in New Zealand. He left behind a document he wrote, which referred to Donald Trump as, quote, "a symbol of renewed white identity and common purpose," unquote. After studying the "alt-right" on Twitter, J.M. Berger came to see Trump as the glue that held the "alt-right" social network together. Berger is the author of the book "Extremism" and co-author of "ISIS: The State Of Terror." He writes for The Atlantic magazine's website and is a research fellow at VOX-Pol, a European think tank focusing on online extremism. J.M. Berger, welcome to FRESH AIR. J M BERGER: Thank you. GROSS: Were you surprised to see a terrorist action like this in New Zealand? BERGER: New Zealand wouldn't have jumped to mind as the most obvious place for something like this to happen. But it's not terribly surprising, especially when we discovered that the suspect was from Australia. There's really a pretty robust kind of right-wing movement in Australia. And so when we found out more about his travels in Europe, the document that he left behind pointed to a very European-influenced flavor of white nationalism. GROSS: Well, you say in one of your writings that one of the largest geographic nodes for white supremacy outside of the U.S. is Australia. That really surprised me. Why is that? BERGER: It's a worldwide phenomenon. I mean, we're really seeing a resurgence of white nationalism in various countries. And in Australia, unlike in the United States, you have some political parties that are more overtly radical right kind of leaning. And I'm not an expert on the intricacies of these organizations. But for some time, people have really been aware of the fact that there was a problem with white nationalism in Australia. And there have been some acts of violence over the course of the last 10 years or so. GROSS: So in Britain, the vote was in favor of Brexit, of exiting the European Union. And I don't think everybody who voted for that is, like, staunchly anti-immigrant. And certainly, not everybody who voted for it is a white nationalist. On the other hand, I think there was a white nationalist fringe and a strong anti-immigrant fringe in that vote that might have helped tip the balance. Do you see Brexit as, in some ways, an expression of the damage that can be done? Because Britain is in such chaos and disarray now. BERGER: Yeah. I think so. I mean, with Brexit, certainly, there were a lot of complicating factors. But there was a component of this that was very much focused on immigration and preserving this kind of mythical British identity. You know, I think that where you can see the effects of - damaging political effects of these movements more sharply is here in the United States. GROSS: And elaborate on that for us. BERGER: So what we saw during the campaign - 2016 presidential campaign - was that Donald Trump really spoke the language of white nationalism in often kind of subtle ways but not so subtle that people didn't take note. White nationalists were actually very suspicious of him at the beginning of his campaign. He's a New York businessman. He had a Jewish son-in-law. You know, these are not qualities that necessarily recommend you to the white supremacist base. But over time, he kept hitting these issues so hard. And when he was pressed on things, he would evade. And they slowly came to see him as an ally and somebody that they could support and get behind. And he helps that movement by creating a continual crisis narrative about immigration. GROSS: Yeah. You say a crisis narrative is really important in creating extremist identities and extremist groups. BERGER: Yeah. Extremist ideologies have three major components. One is identity. So that's the group you're in and the group you hate. One is a crisis narrative. So that's an argument that things are happening in the world, usually threatening but not always, that require decisive action to protect your identity. What we call the in-group is the group that you belong to. So the crisis narrative then leads to a solution narrative. And the solution for extremists is hostile action against what we call the out-group, which is the enemy identity. And so the president and many of his allies in both, you know, mainstream politics and mainstream, semimainstream media are able to provide a just constant stream of crisis narratives. So this is just red meat that's out there for extremists to pick up. If everybody is talking about a crisis, then the question turns to, what kind of solution do you propose to the crisis? And that's where the extremists come in. So they come in with a solution that is deport everyone or create concentration camps or kill everyone. GROSS: So a couple of great examples of crisis narratives would be there's a caravan of migrants headed our way. They're going to invade the country. What are some other crisis narratives that Trump has put forward? BERGER: That caravan is a great narrative for these guys because it resonates with materials that they already know about. There's a lot of writing about - the dystopian novels that have been published over the last 20 years that talk about, you know, migrant invasions and, you know, ships and fleets and caravans of migrants coming to Europe or somewhere else to take over. So that is an extremely powerful piece of this. When you get beyond that, linking immigrants to crime, linking them to violent crime, to gangs, saying they're bad people, saying they're rapists and murderers - all that stuff really is just a - it's a perfect piece for extremists to put into their ideological movements. GROSS: You follow how extremists, white nationalist extremists - you follow how they use social media. And in a study of Twitter that you participated in, you found that Trump is the glue that binds them together, that binds the people in this, like, white nationalist bloc together. How is he the glue? BERGER: What Trump provides is a charismatic personality that everybody can get behind to some extent. Previous politicians - you know, the "alt-right" and white nationalists - in general, you know, we talk about them as being right-wing extremists because where they recruit, where they find their kind of most sympathetic audiences is people on the right side of the political spectrum. That doesn't mean that everybody who's on the right side is a white nationalist. But those are the people who are more likely to be interested in hearing more about the arguments that these guys are putting forth. And previously, previous candidates, presidential candidates that the Republican Party put forward were really pretty clearly against all this stuff. You know, Mitt Romney, John McCain - white nationalists hated these guys. They were really too clearly against them to be of use for the movement. And what they find with Trump is that he's somebody who's much closer to their worldviews. And he declines on repeated occasions to directly attack them. So what we've seen is because Trump is a huge magnet for news attention, for media attention, he's a really useful figure to give all these diverse movements something to coalesce around. White nationalism and the far right, in general, is very factional. Everybody has their own little group. The groups don't get along. They don't believe the same things. You know, there's often a lot of infighting. And they, you know, sometimes kill each other. And what they have now is kind of a common theme, a common cause that they can work into their dialogue and make it more palatable to people. And it helps bring out attitudes that are friendly to what they want. And, really, support for him has become a crystallizing factor. And they can all sort of hold together despite their differences or ideological differences and their organizational differences because they can be for him. So in his absence, what we would see is a much more fragmented movement. GROSS: You have some empirical evidence, too, that he's a kind of common figure uniting different factions of the far-right extremists. BERGER: Yes. So these social media studies are really useful for kind of figuring out what people are talking about. So, you know, in the analysis of these Twitter networks, what we can see is there's a very cohesive group of people who, you know - we can count their hashtags. We can count the terms that they use in their profiles. We can count the links that they put out on Twitter and on other social media platforms. And what we find is, you know, the most common hashtag is MAGA. The most common description of somebody that they use in the profile they use on Twitter is Trump supporter. You know, these things are really clearly present. And it's really - you know, it's not just a subjective call when you look at this, you know? There are different ways to approach this kind of analysis, and I've done both of them. But when we do the social media analysis, it comes shouting out at you. GROSS: You pointed out that Donald Trump declines to directly attack the white nationalists, the far-right extremists. What do you think are the consequences of him declining to directly condemn them? BERGER: I think it has an - a legitimizing effect broadly, and I think it also signals to these groups that he's with them. So one turning point during the campaign cycle while a lot of white nationalists and white supremacists were still suspicious of Donald Trump was a pretty notorious interview he did with Jake Tapper in which Jake Tapper asked him about David Duke endorsing his candidacy. David Duke is a longtime KKK leader and now just a freelance white nationalist, very important figure in this movement. And Trump, who had spoken about David Duke in the past - so he clearly knew who the guy was - but he just stonewalled it. He said, I don't know anything about that. I don't know of David Duke. And what you can see in the message boards and blog posts and forums that these guys talk in is everybody read that as, he's with us. He didn't do what a normal politician would do, which is immediately repudiate that support. He evaded the question. And they understand the practicalities of politics, right? They understand that if Trump said, I'm for the KKK, he's not going to get elected. So what they saw in that is that he was doing as much as he could to communicate to them without completely sinking his chances of winning the presidency. GROSS: Are there recent statements that Trump has made or recent things that he's tweeted that sound to you like dog whistles to extremists? BERGER: Well, more recently, it's been what he hasn't said. So, you know, what we saw after the New Zealand shooting was that he - the White House issued a very perfunctory kind of statement about it, and then he immediately started tweeting about the removal of Jeanine Pirro's show from Fox News. So Jeanine Pirro is a rabid Trump supporter who has a weekly show on Fox. And two weeks ago, give or take, she made some highly anti-Muslim comments, you know, clear bigotry. And the show was deeply criticized for this. Fox News went - did - took the unusual step of kind of making a statement saying, you know, these - she's expressing her own views and don't speak for the network. And then her show, on the weekend after the shooting, was pulled off of the Fox rotation. And so President Trump started tweeting about that very angrily over the weekend after the shooting. And it's hard to see that it's not connected to support for her anti-Muslim comments. I mean, it's hard to imagine that he can see this and be ignorant of the context in which people would hear it. GROSS: Well, there's a lot more I want to talk with you about. But first, we have to take a short break. If you're just joining us, my guest is J.M. Berger, and he is an expert on extremism. He's the author of a book titled "Extremism." He studied ISIS, how they organized, how they recruited, ISIS and social media. And he's also written extensively about white nationalist extremists. So we're going to take a short break, and then we'll be right back. This is FRESH AIR. GROSS: This is FRESH AIR. And if you're just joining us, my guest is J.M. Berger, who studies and writes about extremists. He's the author of the book "Extremism." He's a research fellow at VOX-Pol, which is a European think tank focusing on online extremism. He's written about ISIS, and he's written about white nationalists here and internationally. So the New Zealand shooter left behind a very long screed. And in it, he asked himself the question, you know, do you support Trump? And he wrote, as a symbol of renewed white identity and common purpose, sure. As a policymaker and leader, dear God, no. I can't make out what he's saying there. Is he's saying that Trump is an incompetent leader, or is he saying that Trump doesn't go far enough as a leader? How do you interpret that? BERGER: I think he was trying to be funny. So the manifesto is a particularly problematic document. We've seen extremist manifestos in a lot of previous cases, including some that appear to have directly inspired Tarrant to do what he did and to leave a written record behind. But what we - one of the few things we really know about this guy is that he was very steeped in trolling culture. So the original manifesto and the link to his video were first posted on 8chan, which is a trolling site. And there's all manner of anti-social content on a site like that, including a lot of white nationalism and a lot of other extremely objectionable kind of views. But a lot of what they do is cloaked in this sort of shroud of irony. So they're being funny. And it's designed to provoke people, to offend people, to get them chasing down rabbit holes of content and to put misinformation out that has to be corrected later and kind of muddies the truth around things. So these forums, for instance, any time - almost any time there's mass shooting, for a long time they would put out photos and say that the shooter was a guy named Sam Hyde, which was just a joke - in-joke for this community. And they loved it when the media would pick that stuff up. So there's a real culture here of messing with the media, messing with the mainstream narratives. And a lot of the content in this document is like that. So he may well have had the attitude that he thinks Donald Trump's a great symbol of white identity but is not a very good administrator or something similar to that. But a lot of what's in this manifesto is really designed to mislead. It's not like some of the previous examples we've seen, which are very sincere and ideological. There's a lot of jokes in it. And it's kind of horrifying to think that somebody would kill 50 people to get a series of bad Internet jokes out in circulation in the world. And that's certainly not the only reason he did it; he certainly appears to have - sincerely have these kind of anti-immigration and white nationalist views. But this is sort of a new thing, and it caught a lot of media unaware. So there were a lot of reports that just unironically repeated things that were in the manifesto that were clearly questionable, clearly meant ironically. Some of them are memes or sort of deep-cut jokes that really pulled out of obscurity, and some of them are almost certainly incorrect. GROSS: Has irony become a thing now among white nationalists, and if so, what is the purpose? I mean, is it in part because of social media's - you know, people who are funny and ironic tend to have more followers? Because, you know, humor is enjoyable to follow. And also, you can always say, I meant it as a joke. You can use irony and humor as a way to dismiss criticisms because, no, no, I didn't really mean that literally. So is that more of a thing now than it ever was? I mean, neo-Nazis, in the past, were never known for their sense of humor or irony. BERGER: Yeah. So it's more of a widespread thing. There certainly was some sense of humor and irony in the older days of the movement, but what we see now is that there's a real subculture around this. What we saw in the "alt-right" study was that a pretty big chunk of the followers on there do what we call [expletive] posting. And what that is is the deliberate posting of transgressive materials, where it becomes hard to know if the person is speaking sincerely, whether it reflects something that they truly believe or whether they're being sarcastic and ironic. And that helps them evade policing from the online platforms, and it helps them introduce their content into an audience that might not like a statement that is directly racist or white nationalists - like, let's do a genocide - you can put it out there in a way that racist jokes used to function in this capacity. So you make a racist joke, everybody laughs, there's kind of a shared thing in there, and then that's kind of an opening, a cognitive opening, that you can work with. So some of the people who are engaged in this activity are probably being wholly sarcastic and ironic and just think it's funny to make people think that they are what they're posing as. But as we've seen increasingly over the last couple of years, a lot of the people who take part in this activity really are sincerely attached to these beliefs, and irony and humor may have been a gateway that they found themselves being drawn to and being attracted to, and that exposed them to other ideological influences. GROSS: My guest is J.M. Berger, who writes about extremist groups and is the author of the book, "Extremism." After a break, we'll talk about the manifesto that influenced several extremists who committed massacres, including the Australian who massacred Muslims in two mosques in New Zealand. And Ken Tucker will review a new album by Robert Forster, who's best known as the leader of the Australian band, The Go-Betweens. I'm Terry Gross, and this is FRESH AIR. GROSS: This is FRESH AIR. I'm Terry Gross. Let's get back to my interview with J.M. Berger. He studies extremists. He's followed white nationalist movements in the U.S. and abroad and studied how they use social media to amplify their messages, recruit followers and troll. He's also written about jihadi groups. He's the author of the book, "Extremism," and co-author of a book about ISIS. You can read some of his articles on The Atlantic website. He's a research fellow at VOX-Pol, a European think tank focusing on online extremism. I want to ask you about Congressman Steve King, who's a Republican from Iowa. And he was recently asked by a constituent - a constituent who is concerned that his language seemed to be a little too similar to white nationalist language - so she asked him, do you think a white society is superior to a nonwhite society? And he responded by saying, I don't have an answer for that; that's so hypothetical. BERGER: (Laughter) Well, he's had an answer for it in the past. You know, I mean, I saw him on CNN, during the presidential campaign, essentially say white civilization is better than all other civilizations, and everything good in the world came from white civilization. And Steve King is as close as you can be to an overt white nationalist and be serving in Congress. There's really no ambiguity about where he stands on this. He only engages in the barest minimum of trying to cover his views, and he's been able to function that way for a long time because nobody really wanted to look at it that closely. So after he did that interview I just mentioned on CNN - which, if I'm remembering correctly, was around 2016 - they still had him on the next week to talk about the budget, to talk about, you know, the war on ISIS. They didn't stop using him as a source for credible information about what's happening in the legislature. And his colleagues didn't take any steps to censure him. Now, they did, very recently, finally, take some steps against him. They took away some of his committee postings. And there was a statement of censure in the House. But it didn't come as a big surprise, and it wasn't like they all woke up one day and said, oh, wow. We didn't realize this guy's a white nationalist. He's been around doing this for a long time. GROSS: Well, he even said in January, white nationalist, white supremacist - how did that language become offensive? BERGER: Yeah. I mean, it's - I guess it's a symptom of what's happening in the country. What I think, you know, the rise of these kinds of Trumpian politics have really done is illustrate to us in a very clear way how much racism you can get away with in public discourse. GROSS: So Congressman Steve King recently reposted a meme on Facebook. And it said, folks keep talking about another civil war. One side has 8 trillion bullets, while the other side doesn't know which bathroom to use. You've written recently that almost any imaginable circumstance under which Trump leaves office is likely to coincide with a wave of violence even greater than what we are currently experiencing. I connected that to this meme because it's talking about a civil war and bullets. What are you sensing out in the world of white nationalists about what they might do if Trump leaves office? And I don't know if you mean if he's voted out of office in 2020 or if something else forces him out of office before that. For instance, the Mueller report, impeachment - whatever. BERGER: Yeah. I mean, how he leaves office, I think, is going to affect the scale of what happens. So if he's impeached, you're looking at probably much more, kind of large-scale problems. So my best guess as to what's going to happen when President Trump leaves office is that some of these groups will mobilize, possibly in a way that we haven't seen in a long time in this country but probably not to the degree of a second civil war. We might see something that looks like an insurrectionist kind of movement that, I think, would be very shocking to modern sensibilities, although there's some historical precedent for insurrection in this country. And at the very minimum, we'll see more individual actors or what people call lone wolves. We kind of hate that terminology in my circles - but people who are not necessarily members of groups but who take what's happening with these groups, with these movements in the public discourse, and they access those ideas, and they decide to take action on their own. GROSS: So everything that you've just said about how there's likely to be some level of violence when Trump leaves office, no matter what the circumstances behind his leaving - it's so hard to talk about these things. I don't know whether to say, like, have you just empowered the far right by saying that - by saying, like, they're going to resist? They might resist with violence. Are you informing us of something that we should really be aware of that we might be naive about? It's so hard to talk about these things to know, like, where is the line between information and empowering people with racist views? BERGER: It is a tough call. And we went through a lot of that with ISIS, which I've also done a lot of work on. With ISIS propaganda, do we want people to be informed to such an extent that we're going to rebroadcast a piece of ISIS propaganda and let people see beheadings? Do we let them frame what's happening, or do we try and mediate it? And this is a particular challenge with these manifesto type things. You know, when an extremist writes a manifesto, it's really - it's a work of propaganda. And how we report on it has an effect on how people receive it. So what I try to do whenever I can - whenever I'm talking about this - is to be as descriptive and kind of minimalistic as possible in sort of outlining what I think the possibilities are without dipping into hysteria, without repeating the talking points that people want to use from these movements and just to, as much as possible, put this information out there without it being sensational. But it's hard to do that. So I'll do an interview. We'll have a conversation like this about this possibility. And I go onto Twitter, and the people I did the interview with her tweeting it out as the headline, extremism expert says there will be violence when Trump leaves office. And it's hard to put this stuff out there and try and keep control of the narrative. I think, like, a mistake that helps this kind of cause would be to go out and say, oh, my God - second civil war because I think the evidence doesn't really support that. And the notion of it excites the extremists. And I think that if you can frame it in that kind of cosmic way, even if your intention is just to make people aware of something that's a risk, that's a danger, that framing is really helpful to the extremists themselves. And there's not enough evidence to support us taking on that kind of panic posture at this point. GROSS: So you would prefer that we do not tweet, extremism expert says when Trump leaves office, there will be violence. BERGER: (Laughter) I - you know, it's up to you. I can only control what I say. One of the problems we have right now is a media and social media environment that very much rewards sensationalism, very much rewards talk that excites people and grabs people and scares them. And those are qualities in the social media environment that extremists are really good at exploiting. GROSS: OK. Let me reintroduce you here, and then we'll talk some more. There's still lots left to talk about. If you're just joining us, my guest is J.M. Berger. He studies and writes about extremism, whether it's extremism coming from the far edge of Islam, like ISIS, or extremism like white nationalism. And there's white nationalists around the Western world right now. He's the author of a book called "Extremism." And he is a research fellow at VOX-Pol, a European think tank focusing on online extremism. We'll be back after a short break. This is FRESH AIR. GROSS: This is FRESH AIR. And if you're just joining us, my guest is J.M. Berger, who studies and writes about extremism. He's the author of a book called "Extremism," and he's studied and written about ISIS. He's studied and written about white nationalists. Let's talk about how other countries deal with domestic terrorism compared to how we do. For example, less than a week after the massacres in New Zealand, New Zealand's prime minister announced a ban on assault rifles, military-style semi-automatic weapons, high-capacity magazines and all parts that allow weapons to be modified into semi-automatic or automatic weapons. People have been talking about restraints on guns - you know, gun control - for years and years in the U.S. And every time there's a massacre, there's talk about it. Or people say, this isn't the time to talk about it. But one way or another, somewhere between nothing and very little happens. I'm curious what you think the reaction is going to be to New Zealand's swift ban on assault rifles and semi-automatic weapons. BERGER: I think - within New Zealand politics, as I've been seeing it, I think that this kind of swift action is reflective of the sort of culture and understanding of guns in that country. And I think if you saw something like that happen here, it would have very different connotations, particularly among extremists. And I'm not saying that we shouldn't have some kind of common-sense gun controls, but I'm going to talk about what extremists see when they see that kind of rhetoric. If there's a mythological element that unites a long, wide variety of extremist groups, it's the threat that guns are going to be taken away. So this is just a unifying fear and attitude in these groups, and it's been used extensively to try and promote these movements. So you have a book like "The Turner Diaries," which is a dystopian white nationalist novel that opens with minorities taking over the government and disarming white Americans. And the book successfully conveys that as a apocalyptic event so effectively that even people who are not heavily engaged with white nationalism turned to the book and talk about it as if it was prophetic. Timothy McVeigh, who was not openly white nationalist - although he certainly seemed to have some inclinations in that direction - seemed very little concerned with starting a race war but was very much concerned about guns being taken away. And he promoted "The Turner Diaries" everywhere he went. He passed it off to people. And what we've seen even more in the last couple of years is a wave of other books that seek to maintain the extreme gun control theme without having quite so much of the overt racism. So we've seen a lot of extremist authors. You know, there's this incredible body of dystopian extremist fiction that I'm currently working on for a future project. And what you see is that people from a lot of antigovernment viewpoints, people with different kinds of racial viewpoints - they're all writing books that open up with guns being taken away. So I think that - I don't think that extremists should be able to dictate our policies and public discourse on this, but I think we should also be aware of what effect something like that here would have on them. So, I mean, if this country does move toward a more aggressive kind of gun control, that is going to definitely reverberate in these communities. GROSS: So the man behind the massacres in New Zealand, who left behind a document of many pages - how many pages was it? BERGER: Seventy-four, 79. I'm not sure. GROSS: It's a document that's been referred to as a manifesto. You say there were really just, like, a lot of, like, jokes and memes in it. But he wrote that he was influenced by Anders Breivik. And several other people behind massacres say that they were inspired by Anders Breivik. You describe Breivik as having raised the bar of what a white nationalist could accomplish. Explain who he is. BERGER: So Anders Breivik was a Norwegian extremist who, as far as we can tell, self-radicalized largely online and became deeply concerned with some of the same issues that we see in New Zealand - this kind of anti-immigration, Western civilizational cosmic battle against Islam. And he wrote an incredibly lengthy manifesto - hundreds of pages. And then in 2011, he set off some car bombs in Oslo and then went to a youth retreat and ended up killing about 80 people. And he did this by himself, and his manifesto describes exactly what he did - the steps he went through, how he prepared. And at the time, it was - I found this attack not only appalling but alarming, not just for white nationalists, really, but for extremists of all kinds because it really set a precedent that said that one person can carry out a spectacular terrorist attack - a terrorist attack that is highly lethal and very impactful without resources. And for all extremists who look at that, methodologically, he's very influential. And then what we've also seen is that he is ideologically influential. So the writings that he left frame his actions as meaningful. So the piece that I wrote in The Atlantic, which was two weeks prior to the New Zealand shooting, talked about how these manifestos assign meaning to violent acts. So they take away some of the speculation concept. Is the person just a deranged killer? Is this, like, senseless violence? And they assign the meaning that the killer wants to assign to the actions. And I think, as a result, what I was writing at the time - which was based on a case from last month where another person completely unconnected to New Zealand, a Coast Guard lieutenant, was arrested and had been following the steps outlined in Breivik's manifesto and working on his own attack - and I think that it creates a real challenge for us in the media and for people like me who try and explain things in the media because we don't want to let terrorists choose the framing of their actions. We don't want them to dictate the message that they want to dictate. We don't want to distribute their press releases. At the same time, we want to explain and contextualize what's happening so we can understand it as best we can. And so I think there's a real obligation - and it's a difficult process to do it, but I think we have to try and do it - which is to really mediate the propaganda intent of these documents, to be able to describe what the person is meaningfully saying about themselves and how we should understand it in a broader social context without just taking everything they say and rebroadcasting it to millions of people. GROSS: I want to ask you about social media. You've studied ISIS. You've studied right-wing extremists. ISIS certainly learned how to use social media for amplifying its message and for recruiting. And how well do you think the far right, the white nationalists have done? I mean, how do they use social media to amplify their message? BERGER: They're very effective on social media right now. ISIS was the big case study first. So we saw some use of social media by jihadist extremists prior to the rise of ISIS, but ISIS really turned it into an industrial operation. They had armies of bots that would send out tweets to their content. They were able to make hashtags trend. They were able to make offensive content show up in your timeline. If you were searching for the World Cup at one point, you would see pictures that ISIS was putting out of executions. So that was a real wake-up call for the companies. There had been some interest in suppressing some of this content before, but ISIS really brought it to a crisis. And as a result, what we've seen - and it take - it took a couple of years to happen - is that the companies have become very good at suppressing ISIS content. There's no 100 percent solution; you'll never get rid of all of it. But it's extremely hard to find now. It's hard for ISIS recruiters to operate openly. And so now there are rising calls that these companies should be doing the same with white nationalism. And social media companies are very headline-sensitive. They take action when the headlines turn bad, which is not to say - I have friends who work at these places. And there are really good people who care passionately about this issue. But the leadership of these companies isn't going to take action until there are headlines every day saying - why isn't Facebook doing this? Why isn't Twitter doing this? Why isn't Google doing this? So I think we're starting to approach that point. I think that the companies are also struggling to find general principles that they can act on, ways to define what an extremist group is. So that they can say, we're not going to let extremist groups on this platform, you need to be able to say what an extremist is. And for a long time, there have been no consensus definitions about that. We don't really know what we mean when we say extremism. That's something I've tried to address in my work. GROSS: J. M. Berger, thank you so much for talking with us. BERGER: Thank you very much for having me. GROSS: J. M. Berger's latest book is titled "Extremism." You can read some of his articles on The Atlantic website. This is FRESH AIR. (PHIL KEAGGY AND HOLT VAUGHN'S "BITTER SUITE") Transcript provided by NPR, Copyright NPR.